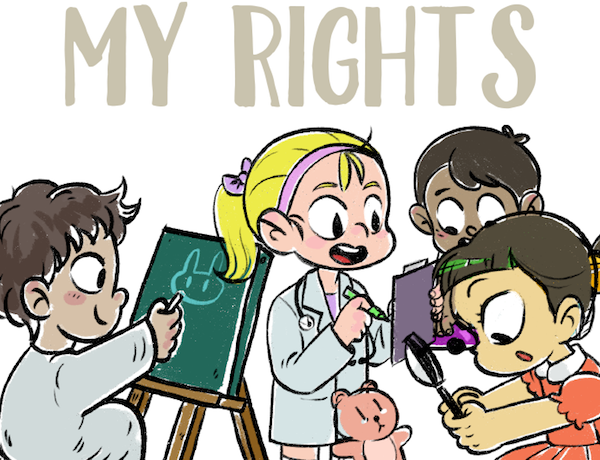 My Rights is a game that introduces the children to their rights in a fun and interactive way. This is an interview with Nayef Al-Booshi from After Work Games. My Rights won the 2nd IMGA MENA Jury’s Honorable Mention. My name is Nayef Al Blooshi, I’m the Founder and Game Designer of After Work Games. A number of talents were involved in making My Rights including Mohammed B. Abdulfattah and Ahmed Al Dhanhani as programmers, Khadija Al Saeedi worked on the Art and Animation of the game, Dale Nichols composed the music and sound effects. For those who don’t know My Rights, can you give us one sentence to describe your game? My Rights is a game that introduces the children to their rights as per The United Nations Convention on the Rights of the Child in a fun and interactive way, it was developed for the Human Rights section in the Community Development Authority in Dubai. We tried our best to make the game with as minimum text as possible and to deliver the messages as a fun experience for the kids and adults alike. We’ve also tried to include a challenge for the older/more experienced players by using the collectible stars to unlock in-game stickers. Now about you and your team: what’s the story behind your studio’s creation? After Work Games is a small company that started in 2011 in Abu Dhabi, UAE. Our goal has always been to create original Arabic video games in the market. We try to introduce new game mechanics in all of our games and to produce content that is suitable for all ages. The design is simple and the cute, the game is educational and fun in the meantime. What inspired you? We were inspired a lot by Nintendo games, especially in their Game & Watch titles and some of their early Nintendo DS games. We noticed that a lot of those games were represented to the player with almost no text or guidance to how to play, but the player kind of gets it easily from the graphical representations made in the game, that was our goal to make the game accessible to all ages. Our main idea was kids sitting together in a nursery and imagining themselves playing with their toys in the role of detective to find abused animals or a doctor to treat sick animals. And it serves us well since we didn’t want to show abused or sick kids in the game, they were all toy animals. How do you feel about winning an IMGA award? Tell us about your victory. It’s such an honor to win the award and be mentioned with the other great developers in the region. We feel encouraged to produce more content. Thank you for recognizing our work and for anybody who played and tried our games. Any new game or project coming out in the next months? Anything else you would like to say to the world? We’re currently busy working on our new title Genie in a Bottle among other smaller projects where we are trying to produce unique experiences. We hope that everybody gets the chance to try out our games and support us by writing about them and sharing them with their friends. Thank you.